What is this? How can someone make such brazen culinary claims? The audacity! really fast, easy, little work, less mess! When you mix flour with water, you create gluten strands. You want bread to develop a lot of gluten, bread gets a lot of kneading. Gluten makes great bread, but tough biscuits and pie crusts. Pastry dough should be moved around as little as possible. 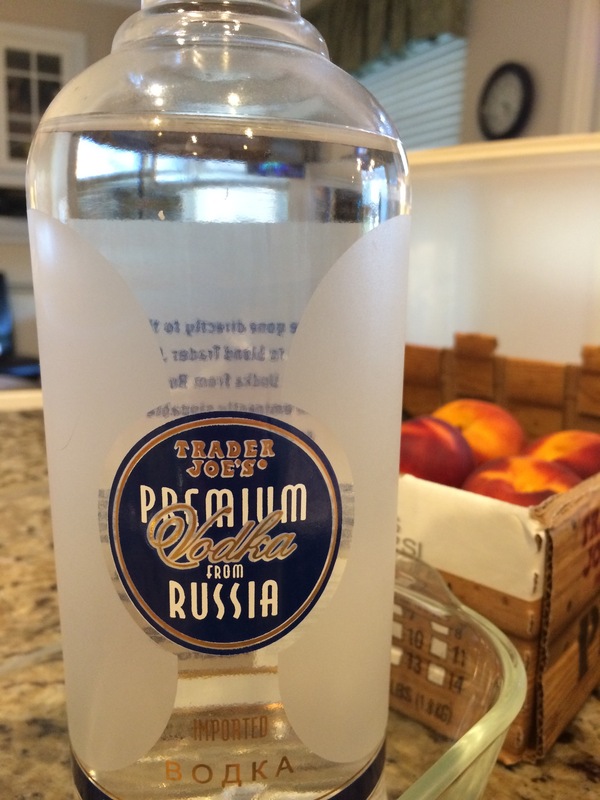 Trader Joe’s, cheap and good! 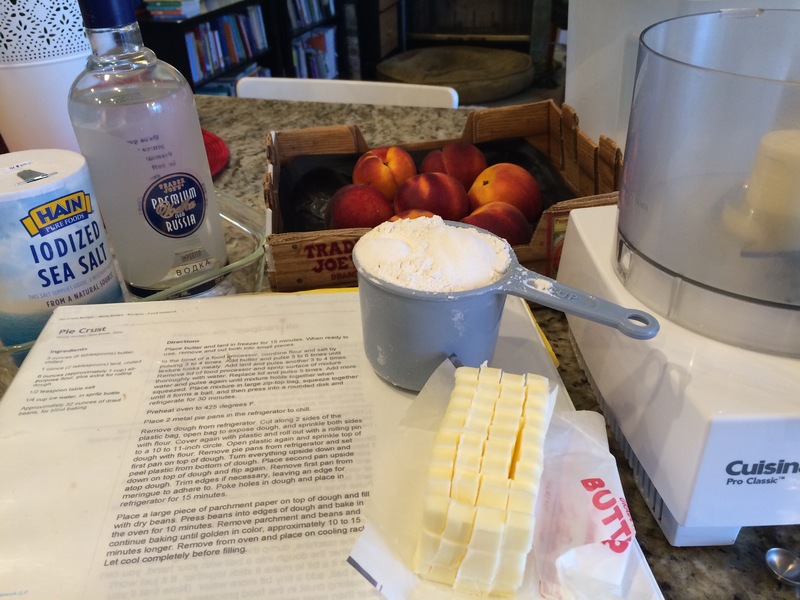 This recipe hinges on using your food processor, really cold butter, and one secret ingredient: vodka. 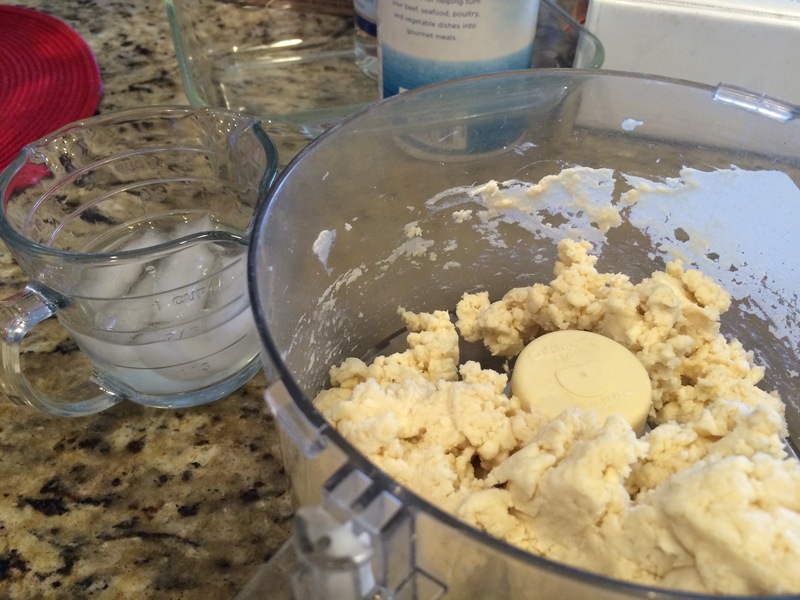 -Into your food processor bowl add the flour, sugar and salt and give them a couple hits of the mix button. -In a graduated measuring cup, pour in 1/4 cup of water, add another 1/4 cup of vodka (now you have 1/2 cup of liquid), then add ice cubes to top it off up to the 3/4 cup line; none for the baker, yet… you have to wait a couple more minute. -Cut butter into small cubes and add to dry mixture, pulse in the processor until the chunks of butter are rice or pea sized. -Now you are ready to add only 1/4 cup worth of your water/vodka/ice… be honest, your cocktail. Pulse the processor blade only enough times to bring together the flour mix and liquid mix, this is where you really want to avoid overmixing. I think my dough came together in less than 10 pulses. 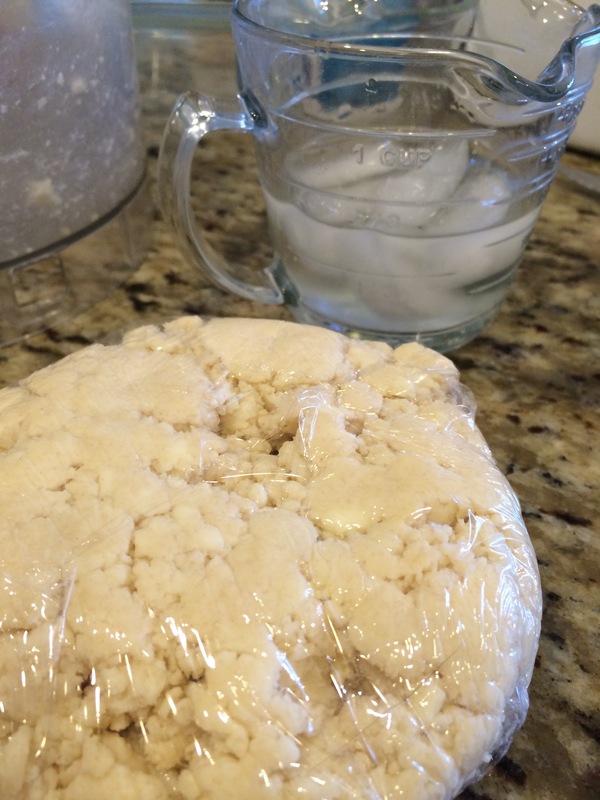 -Wrap the dough in plastic wrap and refrigerate for about an hour or more. Roll out as you need! 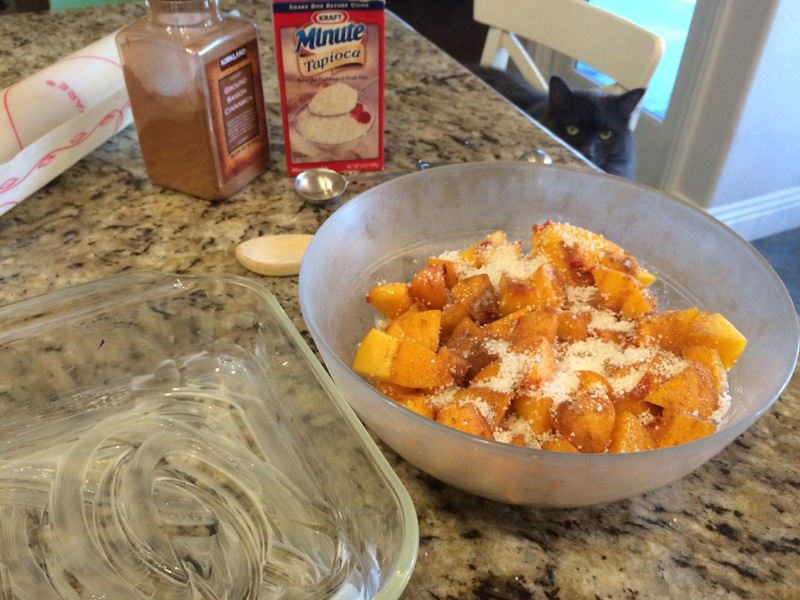 -In a bowl, mix peaches, sugar, cinnamon, and tapioca together. 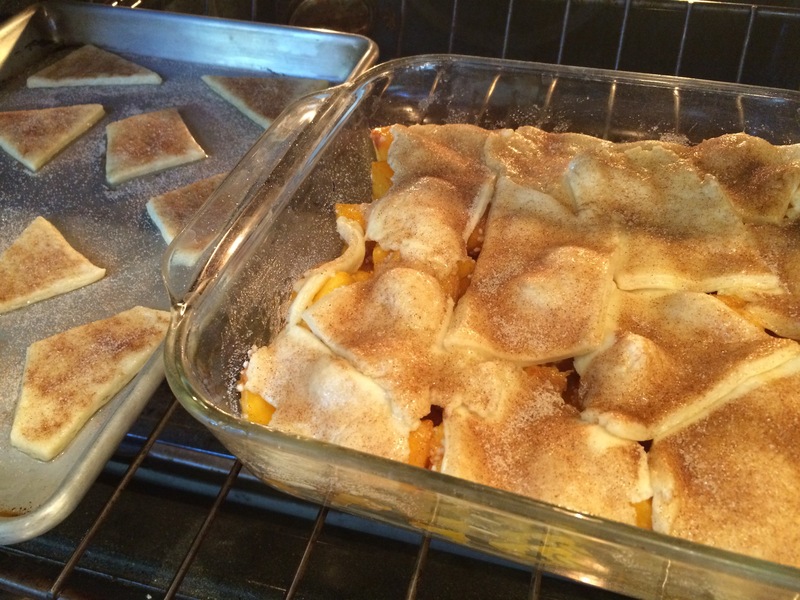 -Butter a 9″ by 9″ glass pan (my favorite) and add peach mixture. Extra dough on tray makes crusty cookies! 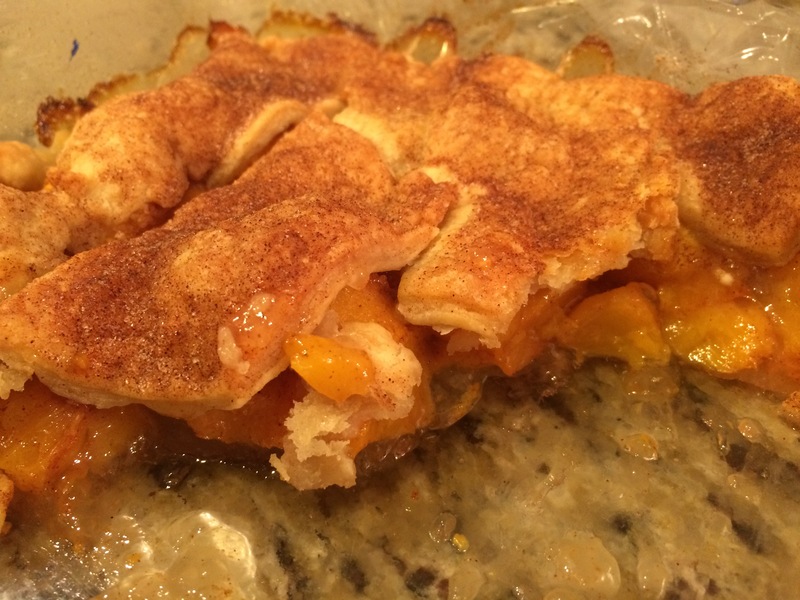 -Roll out dough, handling it as little as possible so it will not be tough, and slice or tear the dough into palm sized pieces to lay atop the peaches. No need to be fancy trying for a perfect 9″x 9″ crust, handle the dough as little as possible and your cobbler’s crust will be tender and flaky! Sprinkle cinnamon sugar mix on top of the crust for a nice finish, if you like. That is what I do. Bake at 400 degrees for 10 minutes, then lover temperature to 350 for another 30 minutes. Let the cobbler cool for ten minutes, top with ice cream if that’s what floats your boat, and enjoy! Half gone before we got a photo. Delicious!